Anchorage is located in Alaska. 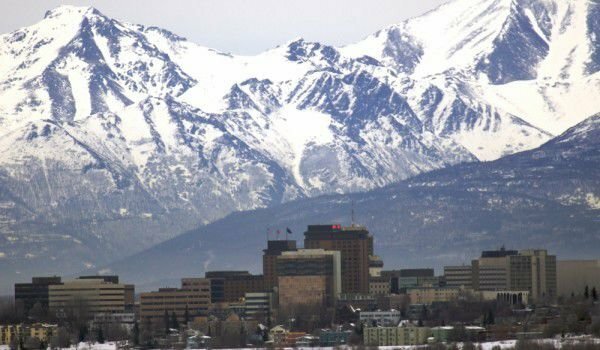 The city of Anchorage has 291 826 inhabitants, making it the largest city in the territory of Alaska. The city extends over an area of 5079 square kilometres. Even in the nineteenth century, there was interrupted Russian presence in central Alaska. In 1867, Secretary of State William Seward signed a deal for the sale of the state. The transaction was carried out by the Russian Empire selling the indebted state for just over seven million dollars. In 1888, a gold deposit was discovered near Alaska. In 1912, Alaska was formally declared the territory of the United States. Anchorage, unlike many cities in Alaska, was neither a fishing or mining area. The city has large deposits of metals and minerals. In 1910, on the territory of today's Anchorage lived only two white men. But suddenly, the city grew and in 1914 this had increased due to the construction of the railway line of the state of Alaska. Alaska railroad was successfully completed until 1923. The area where accommodations were built for project staff became a city. Over this place rose a city, which in 1920 was recognized as a town - it was Anchorage. During the twenties and thirties of the twentieth century, the area of the city grew not only in population but also business projects. After the thirties of the twentieth century, the city grew because on its territory had taken place organizational and military transport operations. Air operations in the territory of Anchorage had taken place at the south end of town, which was used by wealthy people for its golf course. Gradually, the place was turned into an airport, which performed these functions until the end of the forties of the twentieth century. It was known as Merrill Field Airport. After 1951, it was replaced by a significantly greater and newer Anchorage International Airport. On the old airport is still carried air traffic. In May 1964, Anchorage was shaken by an earthquake with a capacity of 9.2. It became known as the Good Friday Earthquake. The disaster killed one hundred and fifteen people and caused damages of over three hundred million dollars. The earthquake lasted less than six minutes. Most buildings collapsed in the first minute. This is the second most powerful earthquake in history. In 1968, oil was discovered and the oil boom became a cause of the global expansion of the city of Anchorage. Expansion of the city continued with a strong pace into the eighties of the twentieth century. To the south is the beautiful fjord Turnagain Arm. To the north extends fjord Knik Arm. The Chugach Mountains offer beautiful views of the east end of town. Tourists who come to enjoy the beauty of Anchorage and its vicinity must be careful because the ice is very thin and there is danger of cracking.